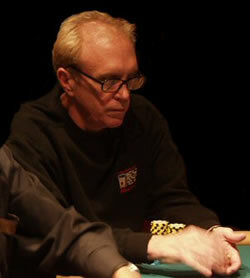 David “Chip” Reese is the best high stakes cash game player in the world. Period. If you ask some of the top professionals to name the best players around, Chip Reese will always be mentioned at the top of the list. Doyle Brunson once said that “Chip’s the best Seven-card Stud player I've ever played with.” Chip began playing Stud and evolved into one of the most successful all-around players in the history of poker. In 1991, at the age of forty, Chip became the youngest person to ever be elected to the Poker Hall of Fame. He regularly plays in the “Big Game” which features Doyle Brunson, Bobby Baldwin, Lyle Berman, and Johnny Chan. Chip Reese was born in Dayton, Ohio. He played poker as a kid using baseball cards as currency and chips. He was a talented gin-rummy player and also excelled at backgammon. During his teens in Dayton, Chip regularly sat in the same games with World Poker Tour announcer, Mike Sexton. Chip studied at Dartmouth College and earned a degree in economics. He crushed all the games on campus and when he graduated, the card room at his fraternity house was named the David E. Reese Memorial Card Room in his honor. He was accepted into law school at Stanford University and was planning on a career as an attorney. Chip Reese does not have a lengthy resume of tournament wins. He has won two World Series of Poker bracelets for Seven-card Stud Hi/Lo (1978) and Seven-card Stud (1982). Shortly after those wins, he stopped playing tournaments. He felt that they were a waste of his time because he could win more money in cash games. He was a regular at the Horseshoe Casino and frequently participated in high stakes games where he could win or lose seven figures in a single session. At the insistence of his children, who wanted to see their father on television, Chip began playing tournaments again. In 2004, he made the final table at the Jack Binion World Poker Open in Tunica, Mississippi and finished fourth in his first televised appearance on the World Poker Tour. Chip Reese is a contributing author to Doyle Brunson’s epic book Super System. Chip assisted with the chapter on Seven-card Stud. At one time, Chip Reese was the poker room manager at the old Dunes Casino. He currently lives in Las Vegas and is a regular player in Doyle Brunson’s home game.